Today is April Fools day. 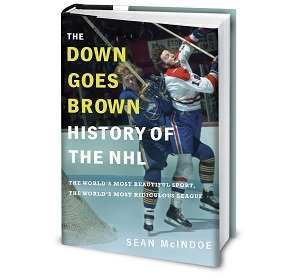 We know hockey players love a good laugh, so in the spirit of the occasion I've prepared some suggested practical jokes that various Leafs and other NHLers can play today. No need to thank me, boys, it's my gift to you. Kyle Wellwood - Between periods, don Timbits jersey and sneak into intermission youth hockey game. Attempt to throw first bodycheck of career. Fail. 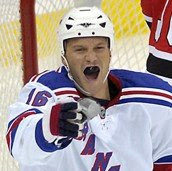 Sean Avery - Just for today, use funny smiley faces instead of zeroes on all personal cheques written to prostitutes. Ray Emery - Perform entire post-game interview with powdered donut on upper lip. Keep asking increasingly uncomfortable Ottawa media what they're looking at. Mats Sundin - Call Cliff Fletcher. Explain that, on second thought, you will accept a trade if it's not too late. Hang up. Giggle. Phoenix Coyotes - Repeatedly ask assistant coach Rick Tocchet how his March Madness bracket is looking. Pierre McGuire - Spend day making and distributing photocopies of "McGuire's Monster". Paul Maurice - Tell Andrew Raycroft he gets to play tonight. Watch how excited he gets. Look, he's even putting on his equipment and everything! Alexander Ovechkin - On first shift of the game, intentionally hit both posts to give goalie fleeting sense of hope before immediately scoring on rebound. 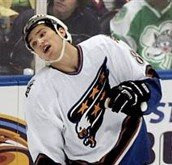 Jeremy Roenick - Nothing. His focus is on winning, not cheap antics that serve no purpose other than calling attention to himself. Peter Forsberg - Play hilarious joke on referee by falling down immediately every time you're touched. Brian Campbell - When asked if you prefer living in San Jose to Buffalo, pretend to have to think about it for a few seconds. Carlo Colaiacovo - When asked "How are you? ", reply "Fine". Dominek Hasek - Spend entire day speaking weird moon-man language that nobody can understand. George Parros - Wear ridiculous novelty moustache over top of ridiculous real moustache. Edmonton Oilers - Print playoff tickets. Oli Jokinnen - Leave note in Richard Zednik's locker reading "Next time, I finish the job". Jason Spezza and Dany Heatley - Play hard on opening shift tonight. Go into corners. Fight through traffic. Earn paychecks. Get back to bench, turn to fans, and say "no, just kidding". Bryan McCabe - Briefly defy direct order from wife. Immediately apologize and assure her it will not happen again. cliff flecther: in post game press conference, remind people to "Help control the pet population: Have your pets spayed or neutered"
Playoff injuries: Would I lie to you? What would it cost the Leafs to trade up to #1?